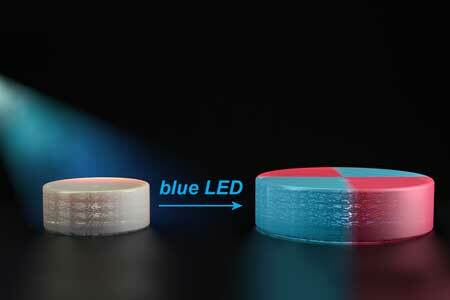 (Nanowerk News) Three-dimensional printing technology makes it possible to rapidly manufacture objects by depositing layer upon layer of polymers in a precisely determined pattern. Once these objects are completed, the polymers that form the material are “dead” — that is, they cannot be extended to form new polymer chains. “The idea is that you could print a material and subsequently take that material and, using light, morph the material into something else, or grow the material further,” says Jeremiah Johnson, the Firmenich Career Development Associate Professor of Chemistry at MIT. This technique could greatly expand the complexity of objects that can be created with 3-D printing, says Johnson, the senior author of a paper describing the approach in the Jan. 13 issue of ACS Central Science ("Living Additive Manufacturing: Transformation of Parent Gels into Diversely Functionalized Daughter Gels Made Possible by Visible Light Photoredox Catalysis"). The paper’s lead authors are former MIT postdoc Mao Chen and graduate student Yuwei Gu. One of the most common techniques used for 3-D printing, also known as additive manufacturing, is stereolithography. By shining light onto a liquid solution of monomers, the building blocks of plastic and other materials, stereolithography devices can form layers of solid polymers until the final shape is completed. Several years ago, Johnson and his colleagues set out to create adaptable 3-D-printed structures by taking advantage of a technique known as “living polymerization,” which yields materials whose growth can be halted and then restarted later on. In 2013, the researchers demonstrated that they could use a type of polymerization stimulated by ultraviolet light to add new features to 3-D-printed materials. After printing an object, the researchers used ultraviolet light to break apart the polymers at certain points, creating very reactive molecules called free radicals. These radicals would then bind to new monomers from a solution surrounding the object, incorporating them into the original material. However, this approach proved to be too damaging to the material and difficult to control, because free radicals are so reactive. In their next effort, the researchers designed new polymers that are also reactivated by light, but in a slightly different way. Each of the polymers contains chemical groups that act like a folded up accordion. These chemical groups, known as TTCs, can be activated by organic catalysts that are turned on by light. When blue light from an LED shines on the catalyst, it attaches new monomers to the TTCs, making them stretch out. As these monomers are incorporated uniformly throughout the structure, they give the material new properties. “That’s the breakthrough in this paper: We really have a truly living method where we can take macroscopic materials and grow them in the way we want to,” Johnson says. In the ACS Central Science paper, the researchers demonstrated that they can incorporate monomers that alter a material’s mechanical properties, such as stiffness, and its chemical properties, including hydrophobicity (affinity for water). They also showed that they could make materials swell and contract in response to temperature by adding a certain type of monomer. The researchers also used this approach to fuse two structures together, by shining light on the regions where they come in contact with each other. One limitation of this technique is that the organic catalyst requires an oxygen-free environment. The researchers are now testing some other catalysts that have been reported to catalyze similar polymerizations but can be used in the presence of oxygen.